The box. – Dirty wet dog , boats and sailing. When we did our last house move i took the oppurtunity to have a long overdue clear-out of ‘stuff’, included in the stuff that i chucked out were several boxes of boat reviews and articles ripped out of the sailing magazines. At the time i thought i had absorbed everything i could from them, i had the boat that i wanted anyway and couldn’t see a good reason to find a space for them in an even smaller cottage so out they went. Of course today when i want to refer to a particular boat or design feature for something i want to write up in the blog it would be great if i could go and refer to the files !, i guess that’s a bit of a ‘doh’ moment then. It became relevant when i was working on the blog post for Al’s boat because my original intention was to do a longer feature with that post exploring the concept of boat as little plywood box and charting where that idea came from and the various ways its gone today. That also goes back to the subject i briefly wrote about yesterday ie that the original idea here was much more a book form project and where within that i cover that kind of idea , the boats that come out of it and ultimately about the owners and what they get out of those boats. To give a different example i wanted to cover the idea of using very small but functional sailboats, feature some of them and then go find their owners and talk to them about their boat and their life with it : the kind of boat and owner here for example like Shoal Waters and her new keeper. Well : that’s just one of the many possible threads of the story i was trying to create and the small plywood box as boat was to be another. I was strongly reminded of this idea last year when we were over in France : the little yellow boat in the title picture is i think a simple, single chine plywood boat called a ‘mousquetaire’ (musketeer) and they are a well known boat over there. Again i wish i could refer back to the files but the way i have it and what i remember myself is that i first came across the class when a whole load of them were rafted up together i think in Fowey when i was on a post Fastnet delivery and they were on passage from the Glenans sailing school . 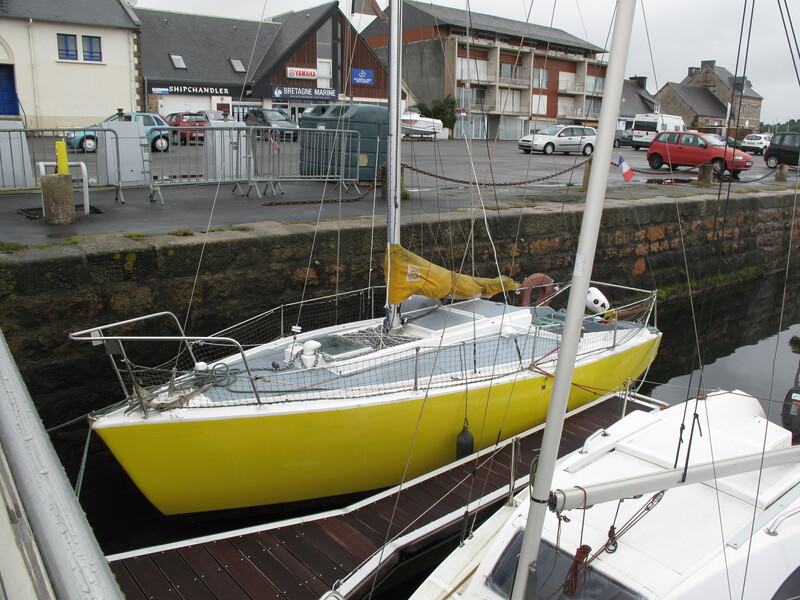 If you will, check out the history of the Glenans sailing school as it was when it was based on the actual Glenans in Quiberon bay as those little plywood box-boats and their crews used to pop up all around Brittanny, the channel islands, Ireland and the UK coasts. They were a very adventurous outfit and i can see today why they turned out so many sailors that could do it ‘large’ with the smallest and simplest of boats…..there really was nothing like them in the UK. Somehow i am reminded of the many people that started their sailing in the ubiquitous small plywood box stitched and glued together in the form of the humble Mirror dinghy, i have never sailed one but nearly bought one recently as a working tender. I didn’t come up through dinghy sailing : more’s the pity as i might have been a better sailor if i did so my introduction to sailing was very the boats that i saw everyday in the boatyard from the long, slim ‘classics’ and their obnoxious ‘club-blazer’ owners through the curve-y but distorted IOR boats that i sailed and to the fat and ugly plastic caravan like Westerly’s and Moody’s at the other. I don’t remember any simple plywood box boats other than one very tired Silhouette (rotten i think) and must admit that i didn’t really understand the multi-chine ply boat that was there : one of David Thomas’s designs i suspect. Its my failure i guess but i just didn’t know enough then about boats to really know the good , the bad and the simply utilitarian : it was maybe years later when i met an owner of something like the little Mousquetaire who just kept popping up everywhere i went in the Frances that i started to realise that these were competent and effective little boats and that they hadn’t cost the arm and leg that the Frances had cost me. I kick myself now for not getting some photographs of that little boat and its owner happily at anchor in the Aulne as the owner seemed to be in a near permanent cruise in a very minimal boat. One Mousquetaire that i did know about had made it to the caribbean where some accident had happened and one chine seam had split and the owner had a terrifying time getting it back into Antigua i think, ashore an then started re-building the crucial chine joint. Last i heard of him he was in the Pacific somewhere !. The little Mousquetaire is THE ubiquitous starter boat in France , as many will know i am a bit of a francophile nowadays and get a lot of pleasure out of poking around French ports and boatyards : there will almost always be a Mousquetaire tucked away in a corner somewhere, of course some will be on their last legs but many have been beautifully and affectionately restored and serve their owners well. Just trying hard to think of a harbour or marina were there wasn’t an example : most of them came equipped with beaching legs and yes there was one in the corner of the drying harbour at Ile de Brehat and i think a couple of them in the inner harbour just over at Roscoff. I think that the above photograph shows the concept at is simplest, its essentially 4 panels to make the hull, add a transom and hey-ho we have a boat : ok so its a little bit more than that but not much. The French seem to have really taken and held this idea of simple boxy little boats, over here many of the similar designs that i know of are rapidly disappearing, indeed in my own travels i have seen several ply-chine hulls rotting away in hidden creeks. I guess the problem was always that pre epoxy and glass they could be vulnerably weak at the chine join and panel scarfs. It was the NIS on the one hand and the boats of James Wharram/Hanneke Boon that mark my point of emancipation from just about everything that had gone before in my thinking about boats and sailing. Remember that at the time i didn’t have and couldn’t afford a boat and that what my sailing time consisted of was trying to nurse maxi boats or big Swan’s and their owners around the soylent with pranging them….and that seemed to need a plethora of skilled blokes like Al and Jaws , huge budgets and still lots of shouting. The idea of the simplest boat that an idiot like me might be able to build and specifically one that could be pulled up onto a beach started right there. Look at the NIS above ( a 23′ i think) and what do we have that is so different to the little Hunter Liberty that serves me well today ?. One idea of mine even recently has been to build a sharpie, going back a bit i researched everything i could about the type from Commodore Munroe and ‘Egret’ forwards via Ruehl Parker and Bruce Kirby. Right now the blog post ‘Sharpy’ is up on the blocks waiting for work. I would of course like to use my own photographs but just as with this one i don’t have any so as with this post they are all other peoples photograhs so all relevant credits go to their owners. As it worked out i didn’t build an NIS but bought a half-finished Wharram 26 , finished that and no…i don’t have any pictres of that great little boat today. That’s enough from me today : in part 2 i want to take a look at where the simple Plywood boat idea has developed . *I should of course say the ‘Late’ Phil Bolger as he sadly took his own life in 2009 after a prolific design career. All credits for photographs go to their original owners.